Modern Machine Shop 125 TOOLING AND WORKHOLDING Carbide Grade for Tools Machining Difficult Alloys The Ceratizit Group offers from-stock rods with two helical coolant holes, as sintered, in the high-performance CTS24Z grade. This carbide grade is designed for the machin- ing of tools out of difficult materials like titanium or corrosion-resistant alloys for high-temperature applications. Similar in hardness to the CTS18D and CTS20D grades, this grade nevertheless features a higher toughness. The company says that in everyday production it provides protection against breakage and provides consistent tool performance. The titanium alloy (Ti6Al4V) is frequently used in the aerospace industry and medical systems sector. According to the company, comparative tests when machining this material have shown that this grade can increase tool life compared to conventional carbide grades. | Ceratizit USA | 800-783-2280 | ceratizit.com walter-tools.com/us Powerful, precise, reliable. 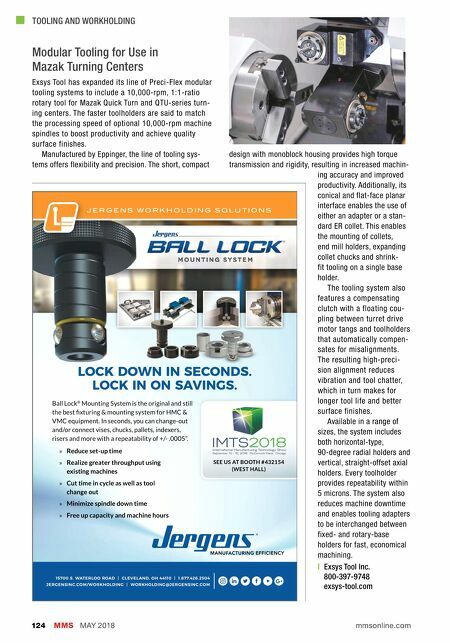 Powered by Tiger·tec ® Silver The new Walter BL A X X generation of milling cutters combines two factors that are crucial for productivity: process reliability and precision. 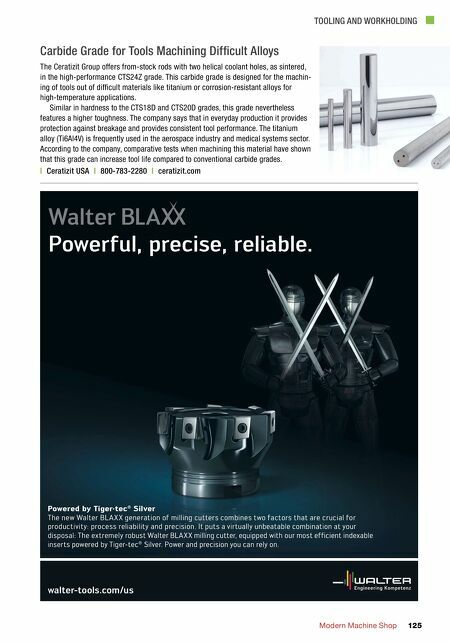 It puts a virtually unbeatable combination at your disposal: The extremely robust Walter BLAXX milling cutter, equipped with our most efficient indexable inserts powered by Tiger-tec ® Silver. Power and precision you can rely on.